The exterior of the Betsy Ross House, 239 Arch Street, Old City Philadelphia. Note this interesting effect- the words on the blue sign seem to glow, symbolizing the difficulty in clearly seeing the history, behind the legend of the maker of the first American flag. Betsy Ross is one of America’s most popular historical figures. In terms of name recognition from the colonial and Revolutionary War period, she ranks only below luminaries such as George Washington, Thomas Jefferson, and Benjamin Franklin. But did she really make the first American flag? For our best answer to this, and many more Frequently Asked Questions about one of the most famous Philadelphians who ever lived, read more. Was Betsy Ross a real person? Betsy Ross was born on January 1, 1752, in Philadelphia. She was a skilled artisan, running her own upholstery shop. Did she live in Philadelphia? Yes. She lived in the city of Philadelphia, for the vast majority of her life. The only exception was in her extreme old age, when she lived in Abington, then a distant suburb from the city, now a thoroughly developed one, in suburban Montgomery County. Worth noting: in her time, the City of Philadelphia was confined to what we know today as Center City; other communities existed within Philadelphia County. It wasn't until 1854, that the city of Philadelphia and Philadelphia County were made coterminous (identical). Although she did some seamstress work, she was primarily an upholsterer – i.e., a highly skilled artisan who worked with furniture. That was her occupation, both in the historical record and in actuality. Was she always known as Betsy Ross? Ironically, although she has gone down in history as Betsy Ross, she would not have been known to her contemporaries by that name, for the vast majority of her life. She was Betsy Ross for less than four years, from the ages of 21 to 25 - while she lived to be 84. Her maiden name was Betsy Griscom. Naturally, she did not become Betsy Ross, until her short marriage to John Ross, on November 4, 1773, at age 21. By his Excellency WILLIAM FRANKLIN, Esq. Captain-General and Governor in Chief in and over His Majesty's Province of New-Jersey, and Territories thereon depending, in America, etc. To any Protestant Minister, or Justice of the Peace, Whereas there is a mutual Purpose of Marriage between John Ross of the City of Philadelphia of the one Party, and Elizabeth Griscom of the same place of the other Party, of which they have desired by License, and have given Bond, upon Condition that neither of them have any lawful Let or Impediment. Pre-Contract, Affinity or Consanguinity, to hinder their being joined in the Holy Bonds of Matrimony. These are therefore to authorize and impower you to join the said John Ross and Elizabeth Griscom in the Holy Bands of Matrimony, and then to pronounce them Man and Wife. After he was killed by an accidental explosion while guarding a supply of American gunpowder, Betsy – now 25 - married her second husband, Joseph Ashburn, on June 15, 1777. She was then known, naturally, as Betsy Ashburn- and subsequently, Betsy Claypoole, after being widowed once more and remarrying. How old was she, at the time she is reputed to have made the first flag? Although often perceived as a much older woman - perhaps because she had been recently widowed - she was actually just 24 years old, at the time of the reputed meeting with George Washington and the Members of the Continental Congress. Congress had passed its Flag Resolution on June 14, 1777, but the alleged meeting took place in May or June 1776, just before the Declaration of Independence on July 4. Did she select red, white, and blue, as the national colors? Unquestionably, the decision to use red, white, and blue as the colors was made by the Continental Congress, in the Flag Resolution. They, in turn, were almost certainly inspired to select those colors, due to the fact that the Union Jack of Great Britain contained those colors. That having been said, many early colonial flags did not contain any, or all, of the three colors. Many had other symbols, such as a rattlesnake or a pine tree. Did she design the 13-stars-in-a-circle American flag? Almost certainly, she did not. The odds that she physically sewed American flags, and/or the first one, are considerably higher, than the odds that she had anything whatsoever, to do with the design. It would seem unlikely that Congress would delegate responsibility for such an important decision as flag design (as opposed to its physical creation), to a skilled artisan such as Betsy Ross, rather than taking it for themselves. Hopkinson was a genuine Renaissance man – lawyer, statesman, author, musician, and artist. He is buried in Christ Church Burial Ground, along with Benjamin Franklin and three other Signers – and ironically, Betsy Ross’s first husband, John. Did Betsy Ross design any American flags? There is no evidence that she ever did. Did she sew any American flags? Yes. There is a 1777 receipt for "Elizabeth Ross" for "ship’s colours" for the Pennsylvania Navy. Did she make the first American flag? Did Betsy Ross ever claim credit for sewing and/or designing the flag? We doubt it. The only source that asserts any claim made by Betsy Ross herself, during her own lifetime, is her own family oral history, which is not reliable. Did a delegation from the Continental Congress ever meet with her, at her house or elsewhere? This is a murky question. Although it was the most populous city in the American colonies, Philadelphia was very small in modern terms, having just about 25,000 people. And there was a family connection between Colonel George Ross and Betsy – he was the uncle of her first husband, John. It is not out of the question, that she might have met members of the Continental Congress through George Ross. In addition, most of the members worshiped at Christ Church, John Ross’s church, which she had joined after being expelled from Quaker Meeting for marrying him. Did she ever meet George Washington, in the alleged time span of the flag’s creation? We would say that it’s not impossible, for the reasons cited above. That having been said, we think that the odds of Washington ever visiting her, at her house, are remote- at least for the meeting between her and the delegation, that allegedly took place, sometime in May or June 1776. We know conclusively, from his own correspondence, that Washington was in Philadelphia, for about two weeks, in that span – from May 22 to June 5, 1776. However, there is no record in his voluminous papers, that indicates that he ever met her during that period. Although there are several references in his papers, throughout the war, to “colours” and “flags”, her name is never mentioned. Moreover, during that particular visit to Philadelphia, the war was not going well. Accordingly, Washington was in town, due to the utmost military urgency, a fact which the documents themselves confirm. There would seem to have been little need for him to involve himself in a matter like this. How old is the story of Betsy Ross making the first American flag? It first appeared publicly in 1870 – five years after the end of the Civil War. Outside of family history, and Philadelphia Quaker and Anglican circles, her name was completely unknown, until then – 34 years after her death, and over a century after she allegedly sewed and/or designed the flag. How did her story become well known? In 1870, her grandson, William J. Canby, presented a paper to the Historical Society of Pennsylvania. Although acknowledging that he lacked complete documentation, he claimed in the paper that his grandmother had told him, as well as several other relatives, that she had been assigned the duty of creating the first flag, by George Washington, Robert Morris, and her deceased husband's uncle, Colonel George Ross. Did she have any children? She had seven daughters, six of whom survived to adulthood – a very high percentage for that time. She had no children with her first husband, John Ross, to whom she was married for only four years; two daughters with Joseph Ashburn, and five with John Claypoole. Did she ever actually live in the Betsy Ross House in Philadelphia? Yes. She lived there from 1773 to 1785, as a tenant. She and her husbands did not own the property. How old was she, when she died? She was 84, an exceptionally long-lived person for that time. When, and where, did she die? Currently, she and her third husband, John Claypoole, are buried at the courtyard of the Betsy Ross House at 239 Arch Street. Why was she buried three times? She was first buried at the Free Quaker Burial Ground, at 5th and Locust, but which was abandoned completely, a couple of decades after her death, due to an early form of urban renewal. We do not believe that this grave marker still exists. If she did not make the first American flag - then who did? This is a very complicated question – and there is no clear, definitive answer. 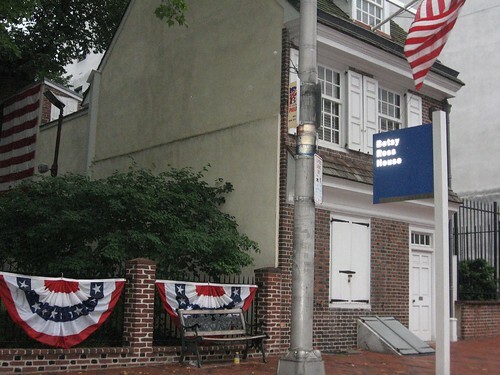 If you'd like to return to the main page for the Betsy Ross House, please click here.